The need to look at alternative energy source is becoming vital as the world's energy demands rises. Solar power is becoming increasingly popular as an environment friendly renewable energy source that produces no pollution, requires minimal maintenance and energy from the sun is free. Solar Energy is being used around the world for powering numerous applications. It works by converting energy from the sun into electricity. Multiple solar or photovoltaic cells are connected to form a solar module. The solar cells will convert sunlight directly into electricity (DC). The electricity from the solar cells is stored in the battery for immediate or later use. 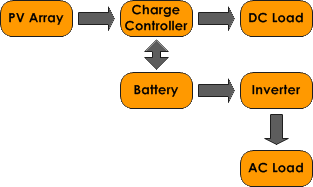 The role of the charge controller is to regulate the voltage and current from the solar cells before it is stored in the battery. It monitors the condition of the battery state of charge and protects the battery from being over-charged. The charge controller will also protect the battery from discharging below its lowest acceptable voltage. Where required, an inverter is used to change the Direct Current (DC) to Alternating Current (AC) to power most AC appliances. The standalone photovoltaic system is designed to operate independently to supply DC/AC electrical loads. The system is one that is carefully sized to cope with the total load demand throughout the day with no additional supplement source. The solar modules forming the array generate the power requirement for all loads. The battery bank is sized to meet all situations of low sunshine period and keeps all loads running continuously. 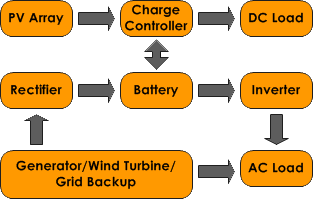 The hybrid system is one that integrates more than one generating source, for instance fuel or wind generator, which will supplement the existing photovoltaic system. The battery bank is recharged firstly by the photovoltaic system and when insufficient, the generator charges the batteries. The grid tie photovoltaic system is designed to work with the utility grid power. 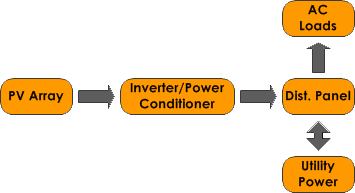 The inverter converts the DC power from the PV array into AC power. The AC power can be used directly by your AC appliances or sold back to your local utility company. The type of photovoltaic system required depends on individual needs and preference. Please Contact Us to get further assistance or information.